Three Poems by Christie-Luke Jones: "Urban Fox," "The Lonely Desert," and "Opal Coast"
Alex DeBonis's work appears in Yellow Chair Review, Parade Magazine, Ilanot Review, Esquire.com, American Book Review, and Small Press Book Review. He teaches creative writing, literature and composition in West Tennessee, where he lives with his family. Dane Cobain, of High Wycombe, Buckinghamshire, UK, is an independent poet, musician and storyteller with a passion for language and learning. When he’s not in front of a screen writing stories and poetry, he can be found working on his book review blog or developing his website, www.danecobain.com. His first collection of poetry, Eyes Like Lighthouses When the Boats Come Home, was released by Booktrope Editions in March of 2016. Joan Payne Kincaid Lives with Rod, a Rescue cat named Cordelia, and Fox Terrier named Fancy She writes and paints in Sea Cliff, Long Island. 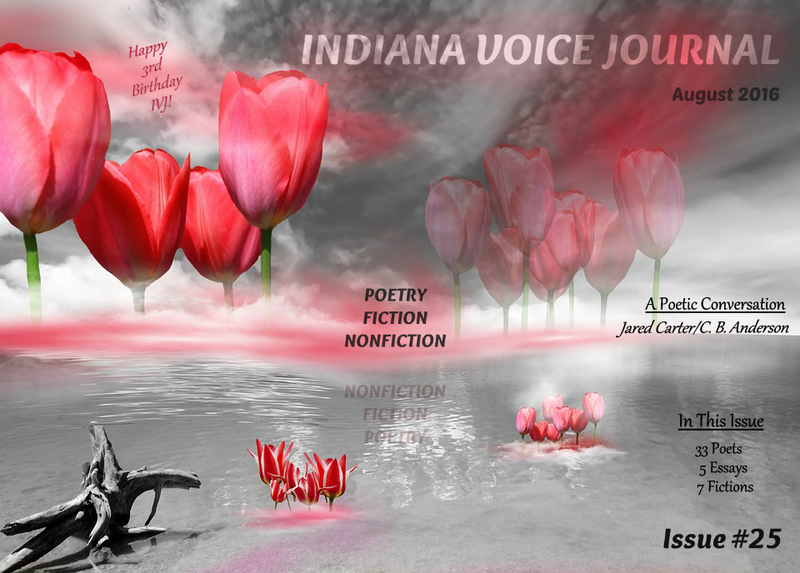 Her work has been published in The Wallace Stevens Journal, Clackamas, Comstock Review, Gargoyle, Hawaii Review, Paris Atlantic, Limestone Poetry Review, Licking River Review, Iodine, Hampden.Sydney Poetry Review, and other journals. Once upon a time she was an Opera and Concert Performer. Her latest book, "Being Here: New and Selected Poems 1988-2012," is available at Amazon. Krista Genevieve Farris grew up a Hoosier, but now lives in Virginia's Shenandoah Valley with her husband and three sons. She has an MA in Anthropology from Indiana University and a BA in English and Anthropology from Albion College. Links to her recent writing can be found at her writer's website https://kristagenevievefarris.wordpress.com/ . Sudeep Adhikari lives in Kathmandu with his wife and family and works as an Engineering-Consultant. His poetry has been published in many online literary journals and magazines, the recent being Kyoto (Japan), Scarlet Leaf Review (Canada), Red Fez (USA), Zombie Logic Review (USA), Uneven Floor (Australia), Dark Matter Journal (USA) and Open Mouse (Scotland). Ananya S Guha lives in Shillong in North East India. He has been writing his poetry for over thirty years. He has four collections of poetry and has been published in numerous magazines, journals, and anthologies in India and abroad. He is a senior academic in India's Indira Gandhi National Open University. Melissa Fitzgerald is a daydreamer masquerading as a student at Northeastern University. She has an imaginary website that is super cool and gets tons of web traffic and hopefully will exist in material form one day. After thirty-five years, Tim has finally retired as a college English instructor, most recently with the University of Wisconsin, Oshkosh. He has written a fair amount of poetry and fiction in his life but has seldom ventured to get it published. Maybe that will change, now that he has even more time to scribble. Steve Colori has had schizoaffective disorder since age 19 and is currently 29. He has eight articles published with Oxford Medical Journals and has been authoring essays for Mclean Hospital since 2011. He has also been lecturing Mclean Hospital’s Harvard Residents since 2012, he lectures regularly at Simmons College Graduate School of Social Work, has lectured at Mass General Hospital’s Schizophrenia Day, and has lectured at NAMI GBCAN. He regularly writes for the Health & Wellness and Social Justice Sections of The Good Men’s Project. He also has a memoir titled "Experiencing and Overcoming Schizoaffective Disorder". He has a website with links to all my publications and more info about me @ SteveColori.com. Susan Duke has had stories published in Timber Creek Review, Straylight, The Griffin, The MacGuffin, Downstate Story Magazine, New Author's Journal, Nostalgia, The Storyteller, Clackamus, The Advocate, Thema, Bloodroot, Evening Street Press, Talking River, Chaffin Review, Whetstone, Oracle, Conceit, and The Santa Fe Review. Retired from teaching children with special needs, I enjoy morning walks, reading, and writing, and treasure time spent with my husband, three adult children and two grandsons. Stuart is an artist, musician and writer with a fondness for comic books and travel. He is a Mario Kart champion and a fan of whiskey. His favourite colour is green. Jim Boswell calls himself "a writer of the spirit from the heartland." A native of Culver, Indiana, he now lives in North Carolina, but continues to write stories and novels that take place in a the fictional Indiana town. He is the author of one published novel, "The Sower's Seeds." More of his work can be found on his blog at: www.indyboswell.com.